The Republic of Armenia signed the Protocol on Water and Health to the 1992 UNECE Convention on the Protection and Use of Transboundary Watercourses and International Lakes (Water Convention) on 17 June 1999 in London. Since then, the process of ratification has been initiated. In order to facilitate the target setting process and gain experience in the implementation of the Protocol, the Ministry of Nature Protection with the assistance of the Protocol’s secretariat has drawn up a project proposal. The project proposal, was submitted to the Project Facilitation Mechanism (PFM), established by the Parties to the Protocol under its article 14 , with the support of which the FinWaterWEI Steering Committee at its meeting in February 2012 made a decision about possible financing of the project. To improve the ability of the Government of Armenia to comply with provisions of the Protocol on Water and Health and to develop targets, target dates and measures to assist Armenian authorities in implementing requirements of the Protocol, thus to promote at national level the protection of life and health of the public both in terms of individual and collective aspects, as well as to improve the management and use of water resources, including the protection of ecosystems, to improve safe water supply and discharge, and to control and reduce water-related diseases. 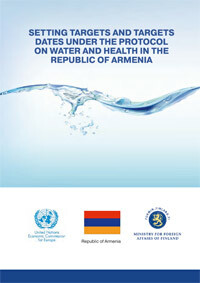 – To facilitate the ratification by Armenia of the Protocol on Water and Health. The NGO Armenian Women for Health and a Healthy Environment, which coordinates the inputs of the NGO community and provides logistical support. Under the project, the following bodies will be set up: A Working Group (composed of experienced national experts and representatives of the UNECE secretariat), a Steering Committee, and a NGO Coordination Mechanism. Project duration is 18 months and will be accomplished at the end of June, 2014. The targets and target dates under the Protocol will be set by the end of the project. It is also expected that Armenia will have finalized all necessary internal processes to become a Party to the Protocol.